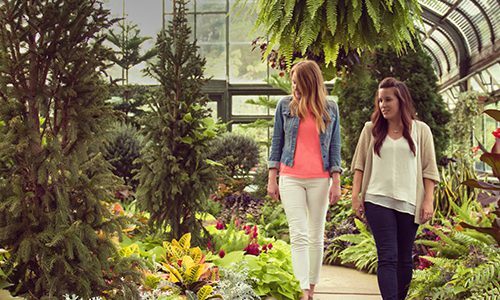 Enjoy all the natural wonders of Niagara with our Niagara Falls Adventure Pass Plus! The all-access pass is your ticket to all Niagara has to offer, from heritage sites and White Water Walk, to sailing into the falls themselves. Make your way across Niagara Parks with the most complete adventure available. Enjoy access to all Niagara Parks attractions as well as a ride on Hornblower Niagara Cruises. You’ll also get two days on WEGO, the hop-on, hop-off visitor transportation system, as well as the Falls Incline Railway, connecting the Fallsview tourist area to Table Rock Centre at the brink of the falls. The Niagara Falls Adventure Pass Plus is your ticket to experience everything that Niagara Parks has to offer! Make your way across Niagara Parks with the most complete adventure available. This Pass includes access to all Niagara Parks attractions as well as a ride on Hornblower Niagara Cruises. You’ll also get two days on WEGO, the hop-on, hop-off visitor transportation system, as well as the Falls Incline Railway, connecting the Fallsview tourist area to Table Rock Centre, at the brink of the falls. 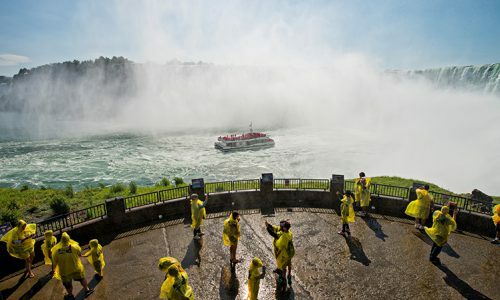 The Niagara Falls Adventure Pass season begins May 8, 2019. Visiting soon? The Niagara Falls Wonder Pass is valid November 5, 2018 – May 7, 2019. Traverse the network of tunnels and make your way to the base of Horseshoe Falls to enjoy one of the world’s most remarkable views. 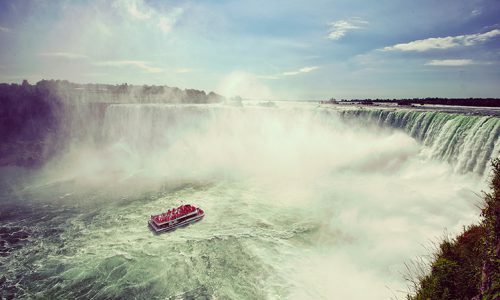 Sail into the heart of the Horseshoe Falls on this thrilling boat tour. This gentle mist will transform into a downpour as you approach the spectacular Canadian Horseshoe Falls! Experience a first-hand lesson in the raw power and peril of the Niagara River’s Class 6 white water rapids. 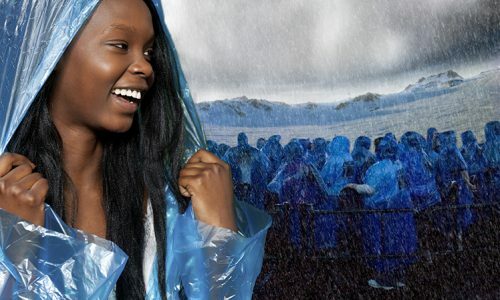 Re-live the formation of Niagara Falls with this exciting 4-D experience, perfect for the whole family. 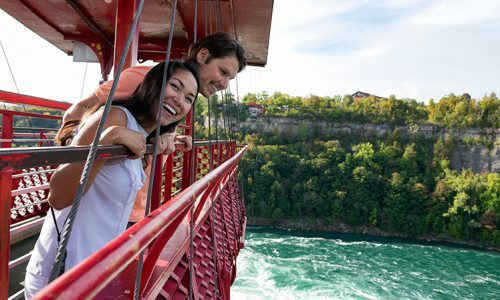 Designed by renowned Spanish engineer, Leonardo Torres Quevedo, the Whirlpool Aero Car has been soaring the Niagara Gorge since 1916. 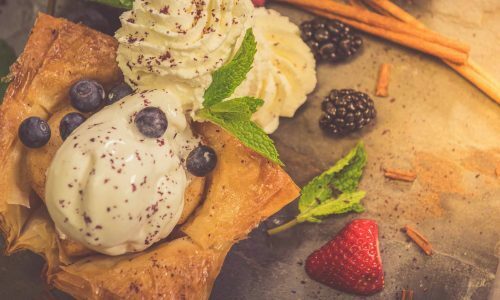 Immerse yourself in this unique, family-friendly attraction that includes 180 meters of trails and up to 45 different species of butterflies! For over 70 years, visitors have come to discover paradise at this lush oasis, just a short walk south from Niagara Falls and Table Rock Centre. Collections of orchids, succulents, and other tropical plant species are on display throughout the year, along with floral shows that reflect the changing seasons. With seven shows per year, something new is always in bloom. 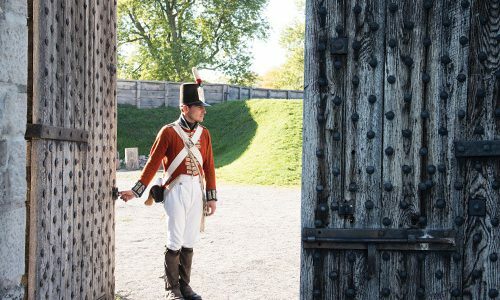 Experience 4 incredible Niagara Parks Heritage sites as part of your pass: Old Fort Erie, Laura Secord Homestead, McFarland House & Mackenzie Printery. Three separate WEGO lines all come together at the brink of the Horseshoe Falls, at Table Rock Centre. Leave the driving to us and take WEGO everywhere you need to go on your Niagara Parks adventure. The Niagara-on-the-Lake Shuttle extension is included as part of the Adventure Pass Plus for 2 days. Please note that the shuttle does not service Old Fort Erie. 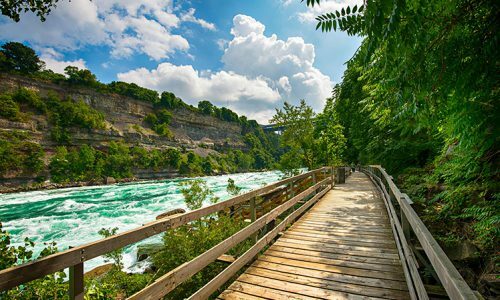 Enjoy two-day access to WEGO as part of your Niagara Falls Adventure Pass and leave the driving to us! WEGO runs year-round and includes frequent, convenient stops at all major attractions and hotels. Why Buy the Adventure Pass Online? Buy your Niagara Falls Adventure Passes online now and save up to 43%. Save time with exclusive timed ticketing. What is the Niagara Falls Adventure Pass? The Niagara Falls Adventure Pass is a package of popular Niagara Parks attractions. Each Pass includes one-time admission to the listed attractions, along with two days of access to on WEGO, the hop-on, hop-off bus transportation system that connects Niagara Parks with your hotel and other tourist areas in the city. You'll also receive valuable bonus coupons for other experiences, dining and shopping. When you arrive at Niagara Parks and redeem your online tickets, our Welcome Centre or attraction staff will help you book times for each of the attractions on your Pass. Look for special "Online Purchaser" lines to fast-track your adventure! Your pass is valid all season long, until November 4, 2019. Whether you want to experience everything in one day or spread your admissions out over your entire visit, it's totally up to you! The included WEGO and Falls Incline access is however for consecutive two-day use. If required, ask at a Niagara Parks Welcome Centre how you can add more days to your WEGO access.